It’s been a long time but I never gave up on Vogue 1335. Here’s a peek at the finished item. And here’s the original Vogue pattern photo. It’s a Guy Laroche design from Vogue’s autumn 2012 release. I’ve stuck fairly closely to Vogue’s interpretation of Marcel Marongiu’s vision (fasteners aside, of which more another time). However I don’t think the pattern as written has nearly enough interfacing to produce the rounded shape in the pattern photo. Vogue has you interface the facings and neckband only. I ended up interfacing the lot: the body, bands, welts and facings in fusible canvas; the sleeves in Vilene G405. I thought canvas might be a little heavy for the sleeves. Originally I wasn’t quite sure what to use for those. Normally I choose interfacings by going to John Lewis and having a feel of the different weights available, but my local branch seems to be reducing its range and I couldn’t find anything that seemed suitable when I visited. Clearly I was going to have to risk buying interfacing online. I picked out Vilene G405 after a detailed perusal of the options on the Vlieseline website – which incidentally is a fascinating read for a sewing geek. G405 is obviously one of Vlieseline’s less popular products because I could only find one online shop selling it in the UK: Moresewing on eBay. But one is enough. The fusible canvas (picture below) came from John Lewis – I hope they don’t stop stocking that! I wanted to cut all the interfacing without seam allowances so I made separate pattern pieces for interfacing rather than simply cutting out the shell pieces again in fusible. It took forever to make the extra pattern pieces but it was worth it. I’d rather cut extra pattern pieces than fight with fusible that’s slightly too big for the piece I’m fusing to. I think the sleeves worked out OK. They have the rounded shape from the pattern photo even without arms in them. 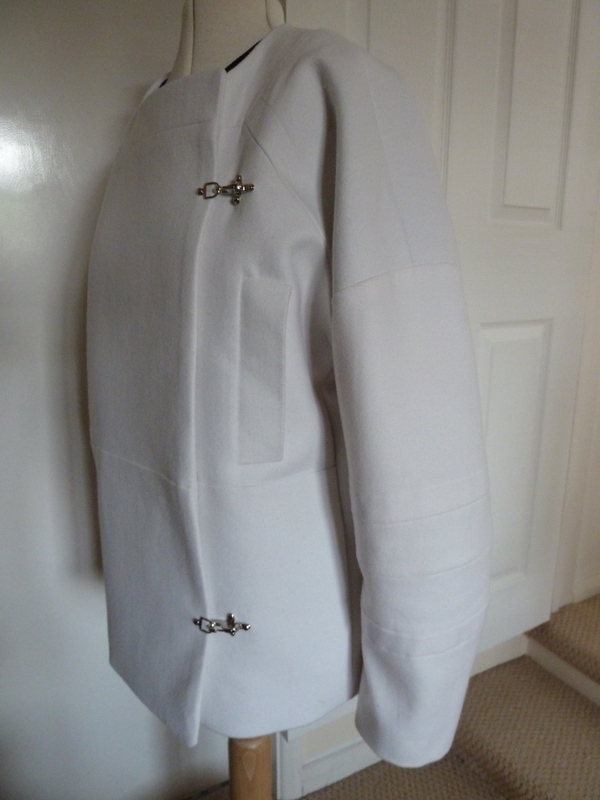 With hindsight I think it would have been fine if I’d just used the canvas for the sleeves, but I’m glad to have discovered the Vlieseline website as it’ll take some of the guesswork out of buying interfacing online in the future. Next time: a shaggy dog story about fasteners. Posted on July 12, 2014 July 12, 2014 by catherinedaze	This entry was posted in dressmaking, Fabric, Guy Laroche jacket, sewing, Techniques, vogue and tagged dressmaking, guy laroche, interfacing, sewing, vogue. Bookmark the permalink. You know, I was just thinking today I haven’t seen you post in a while! I love how this turned out, it really looks like the picture. How did you figure out you needed more interfacing? Just good-old tailoring intuition? Thanks! I compared the drape of my fabric to the picture and came to the conclusion it would never hold that shape without interfacing despite what the pattern said. Another fabric might have behaved differently, but in general I find I want to use a lot more interfacing than patterns recommend on anything like a jacket or coat. it looks amazing! can’t wait to hear the story about the fasteners! Long time, no see, but worth the wait for a great update…I love how your coat turned out! And the style is so different from all the sameness I’m seeing on the other blogs, it’s like a breath of fresh air.. I was so thrilled to see a post of yours pop into my reader this morning! The coat looks wonderful. Amazing what the right amount of interfacing will accomplish. And I agree with your ruling on sewing instructions: very few actually bother to tell how to accurately interface a garment. I think patterns presume on sewists’ experience to make the judgement call on each garment. looks great, I hope you’ll post pictures of you wearing it! Have been anxiously awaiting your post…..so was very excited to see the beautiful results! It’s like an exquisite piece of sculpture! I think your fasteners are more successful than the ones in the original…with the silver clasps providing a nice contrast to all the white. When will you treat us to photos of you modeling the garment??? Will be curious to see what you pair with it. Beautiful! I have wondered so many times how this turned out, you were at the ‘find a fastner’ stage when I last saw it. And I like yours so much more than what Vogue did! Your coat is just lovely. Great to see you back – I was wondering how you were getting on. Looking for to seeing it on! Oh wow, this looks fabulous! I agree: the right interfacing can really lift a garment into professionalism, and its experience that helps you gets the right interfacing, not instructions. My other gripe is the amount of stretch in knits to work with the pattern. Some give it, but most don’t. Oh, so true. Although I’m grateful for any guidance as to fabric choice. 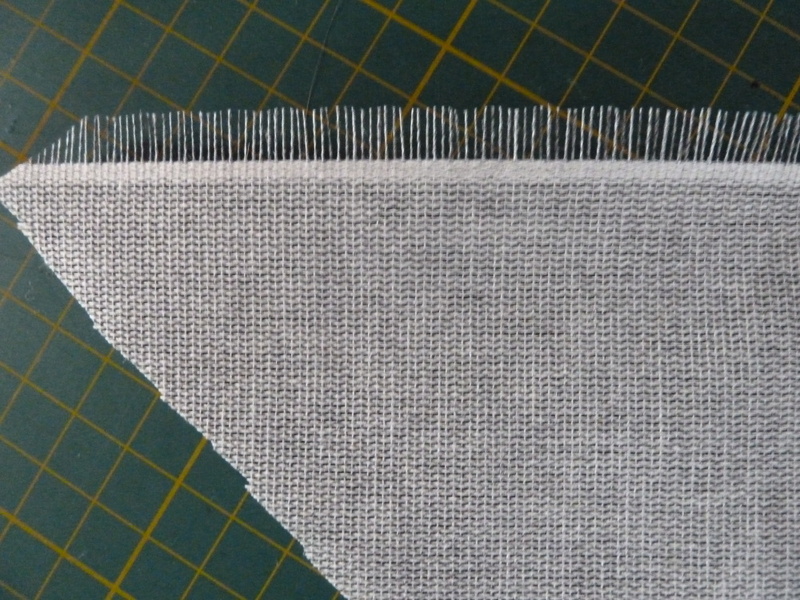 I’m currently making something from one of the Drape Drape books which I have in the Japanese edition, and I’ve no idea what sort of knit it’s intended for. On my last attempt from that book I guessed wrong and although I love the dress it came out looking nothing like the original design. This is looking great! What a fantastic project. Will you post pictures of yourself wearing it? I can’t wait to see it on. I’ve been eagerly awaiting news of your jacket! It looks very modern and almost avant garde, can’t wait to see pictures of you wearing it. I’m a new reader (and new sewist), and appreciate the detail you give with each of your projects. This coat is fabulous, and can’t wait to read more. Wow, excellent work on this jacket!